We Lost Her is a unique book that takes the reader on a real life, intimate journey of grieving children. Seven siblings, ages seven to seventeen at the time of the tragedy in 1970, relate how they each dealt with the news of their mother’s tragic death. The book chronicles their mourning and how grief impacted their lives both then and now. 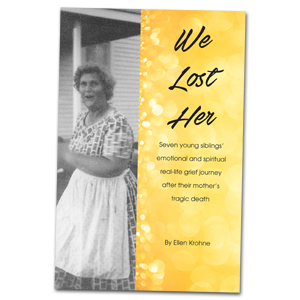 The story is told through the eyes of Ellen, the third oldest sibling and weaves an intimate tapestry of loss, family grief and pain, self-help, growth and learning.